You may think that the above picture is some sort of study from Da Vinci’s “Last Supper” but it’s actually the panel from my presentation at Toronto Con this past weekend. From left to right it’s Gerhard, James Waley, Fadi Hakim, some photo bomber, and Richard Comely. We talked about what made a comic a Canadian comic and when each one became aware that there were Canadian comics. 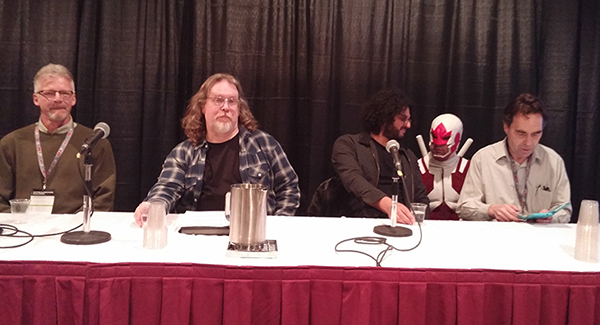 We also talked about what was going on in comics when each of the panelists became involved in Canadian comics. We had a great crowd who really seemed interested in the history of Canadian comics and asked some good questions. I have been corresponding a little with Brad Middleton and got to meet him at the end of the presentation. Brad is a master of the horror genre and has written a book on vampire television and he is presently working on a book looking at the history of the horror genre in Canada called The Great Fright North. 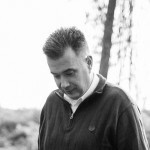 Brad has a blog column called “My Bloody Obsession” at http://www.bradmiddleton.ca/p/main.html. 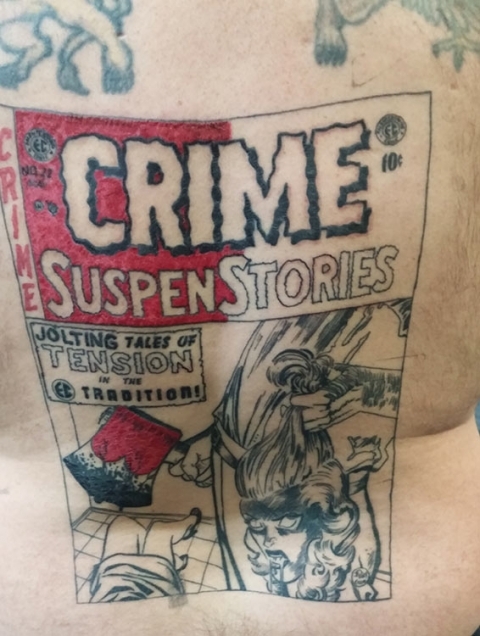 Anybody wanting a comic cover tattoo (or any tattoo or piercing whatsoever for that matter) head on over to Tony’s shop on Water St. in Peterborough. They won’t let you down. 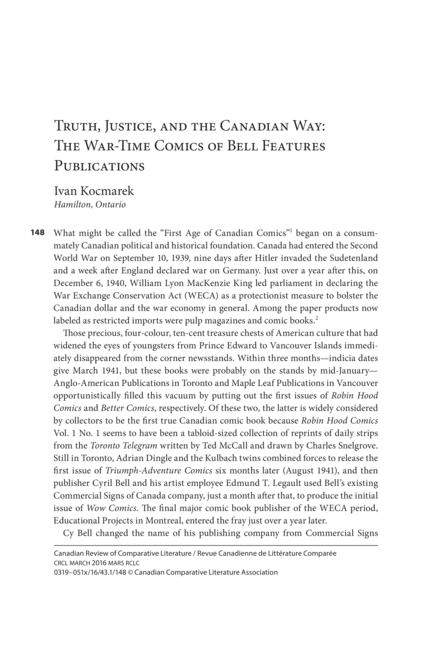 The title of my paper was “Truth, Justice, and the Canadian Way, the War-Time Comics of Bell Features Publications.” I have no idea where a copy can be obtained other than in university and some public libraries. Perhaps I should post the whole thing here as an extended column and see if I get chased in some convoluted way for breaking a copyright control on my own piece? Title page of my recent article. Last week I also approached the Canadian Warplane Heritage Museum here in Hamilton to see if they would be interested in putting together an exhibit of the way in which the old WECA comics depicted the Second World War and they seem interested in pursuing this further for 2017. 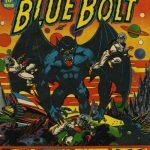 It would be great to see some of the original Bell Feature art pages from the Library and Archives of Canada on display at the Museum for a month as well as some of the original comics and maybe some cover pics and pages blown up to poster size. I think such a thing would present a positive and popular exhibit if we could have it up for a month or so… maybe we could even arrange to have it travel if some grant money is available. Still, I don’t want this column to be a total self-indulgence so let me turn to the WECA Bell Features books a little. 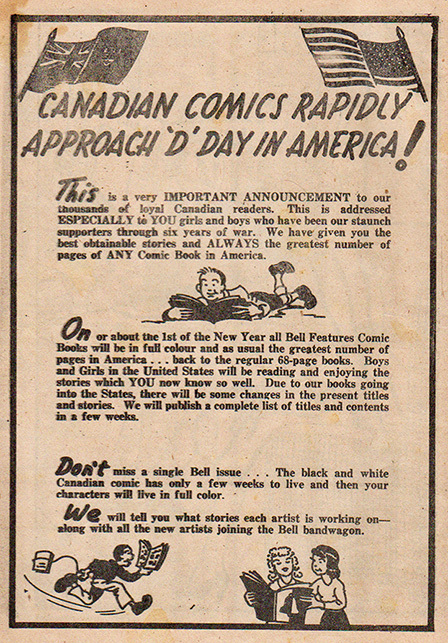 During that fateful year of 1946, Bell Features seemed to be the Canadian company that was trying to survive the most in the face of returning American comics. I say this because it seemed to have promised the most for the future. Look at the back cover for Commando Comics No. 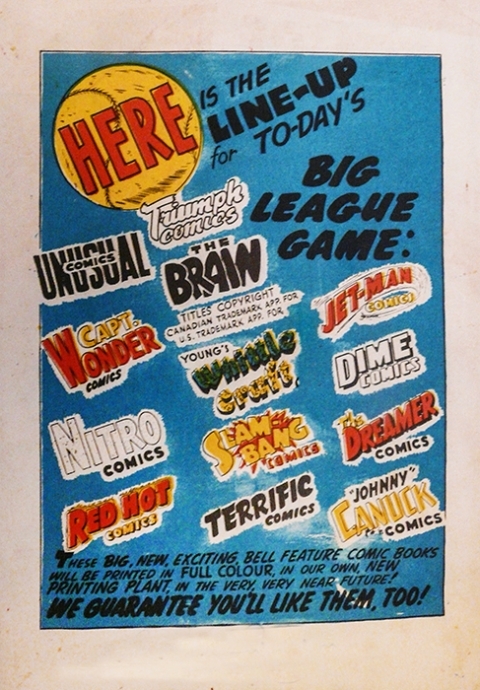 22 and the identical back cover for Slam-Bang Comics No. 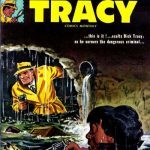 8 which, though it had a new René Kulbach cover on the front, was filled, ironically, only with American reprinted content. The promise seemed to be new comics featuring The Brain, Nitro, Capt. 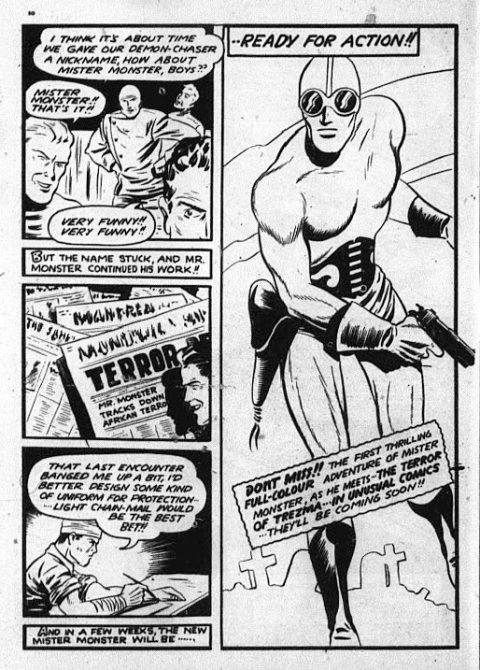 Wonder, The Dreamer, and Johnny Canuck (funny that they never considered giving Nelvana her own title; perhaps they intended to continue her as a feature in Triumph Comics). What we actually got was the previous issue of Slam-Bang Comics which brought together a number of leftover stories as the main Bell Features titles were crumbling apart through attrition and then about a year later a cobbled together collection of some more leftover Bell stories by F. E. Howard in Super Duper Comics No. 3 (where Michael T. Gilbert first saw Kelly’s Mr. Monster). 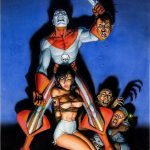 Everything else on that back cover of Commando Comics 22 was filled only with American reprint content or just didn’t come out at all. 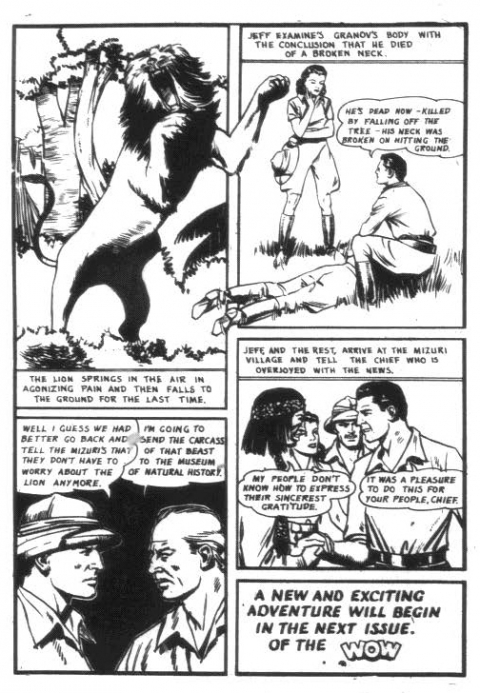 Cyril Bell’s hopes for his comics were reaching far and wide at the end of 1945. 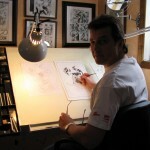 Take a look at his announcement on p. 8 of Dime Comics No. 27 which has a palpable aura of irony around it. We all know that last Mr. Monster panel in Triumph Comics No. 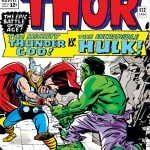 31 which promises the next full-colour installment in Unusual Comics No. 1, a book which contained only American reprints when it came out. Let’s also look at some of the promises Bell Features made in the final original stories of some of its main characters. 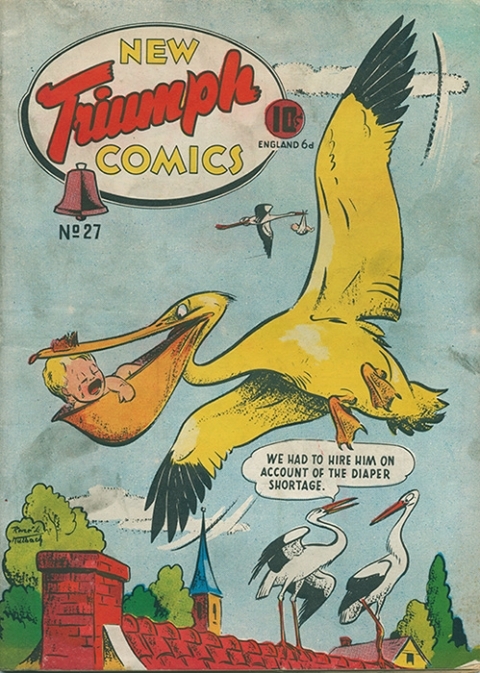 Here is New Triumph Comics No. 32 (even though the covers says No. 27) and was the issue that followed after that last Mr. Monster panel. 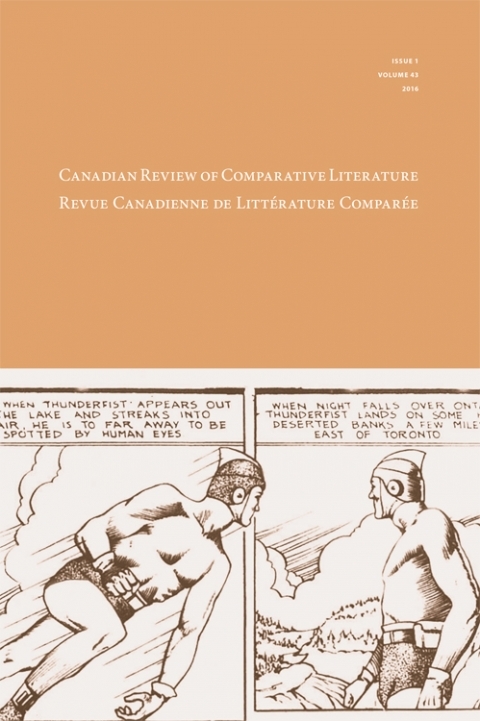 The artwork for both these front and back covers is by René Kulbach and the covers of all the comics depicted on that back cover were newly drawn by Canadian artists, but the guts of each one of them were American. In Active Comics No. 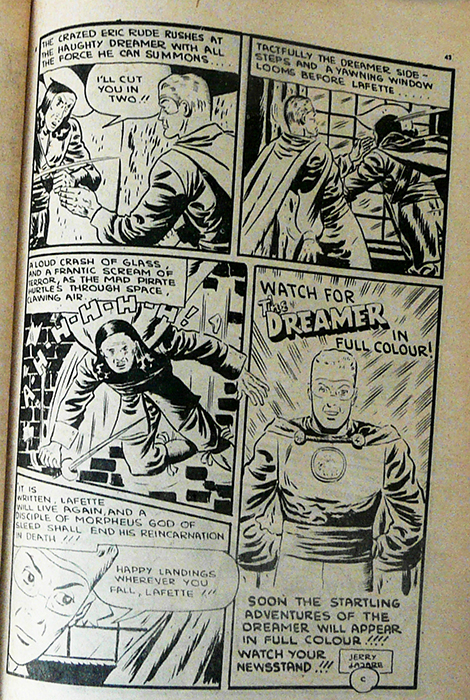 28, the final Canadian content issue of the title, the last panel of The Dreamer story promises an appearance by the hero in full-colour in the next issue. This never happened of course and The Dreamer’s own title as promised in some ads never happened as well. 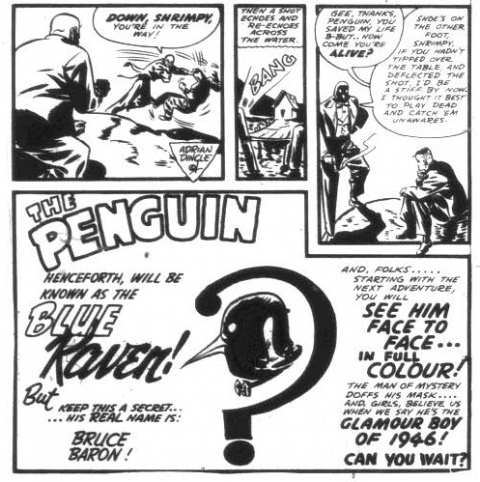 The final issue of Wow comics promised the reappearance of both Jeff Waring and the Penguin. The former in the next issue of the title and the latter somewhere less definite andmorphed into the Blue Raven. 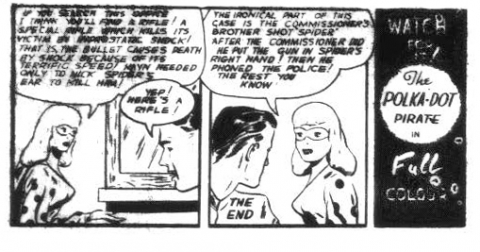 Both did appear in Slam-Bang Comics No. 7. A further new Jeff Waring story in colour also appeared about a year after that in Super Duper Comics No. 3. 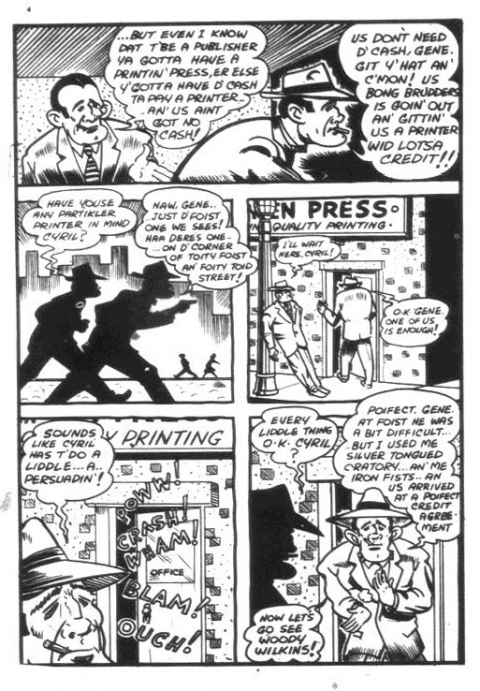 The last appearance of the Polka-Dot Pirate in Commando Comics No. 22 also promised a full-colour new story and we also got that in Slam-Bang 7. 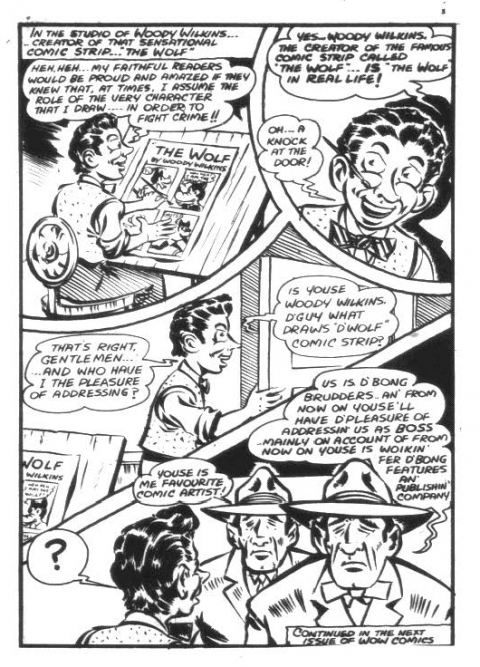 One story arc I lament was never finished was Tedd Steele’s “Woody and the Wolf” story also in that final issue of Wow Comics. 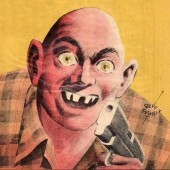 Here Tedd parodies Cy Bell and brother Gene who stood at the helm of Bell Features. 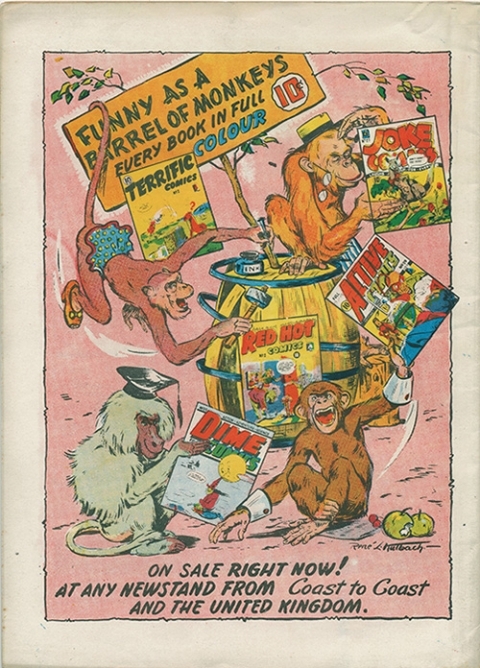 He had already parodied Cy and fellow artists Ross Saakel and Leo Bachle in Joke Comics No. 16 and in a short series of stories about Cy Bell’s hockey team “The Panthers” in Active Comics Nos. 19-21. Here are the last four pages of the story. I wonder where it would have gone and, in fact, if the follow-up had actually been completed. 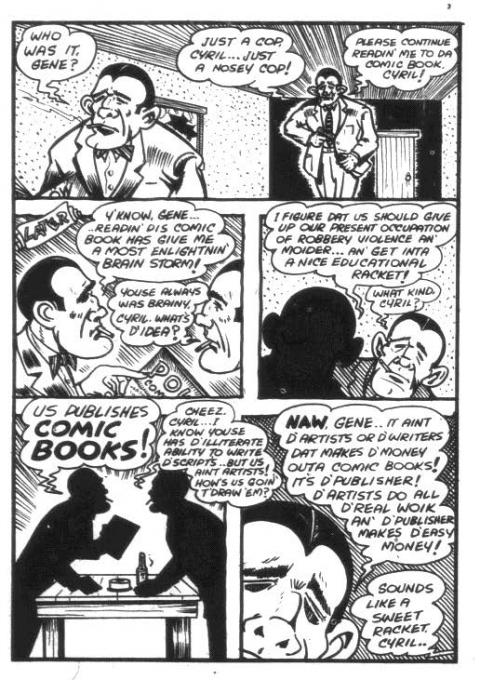 As we know, the guillotine fell quickly and abruptly for all the Canadian WECA publishers and the only other books that came out for Bell Features other than Slam-Bang Comics No. 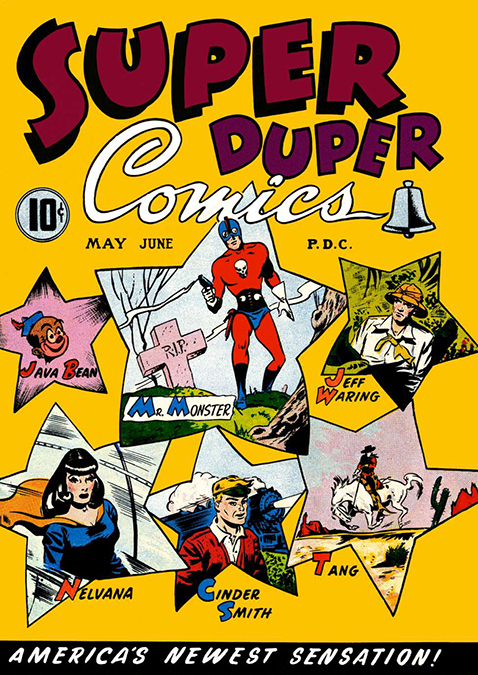 7 and F. E. Howard’s Super Duper Comics No. 3 were filled with American reprints. Something to lament indeed. Wow, professor! Loved the opening line, all the great info and especially the tattoo. 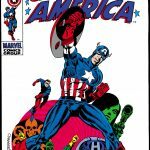 As both a Yankee and Canadian by birth this and the CGC boards are my two favorite spots to learn about comics! Thanks for the kind words, John. How did you know I was a professor?! 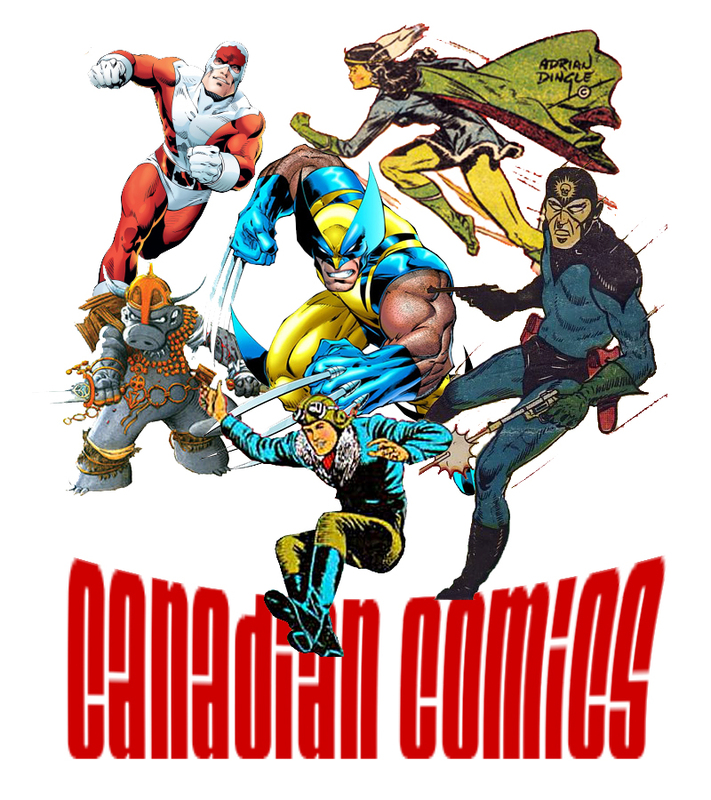 This is indeed the place to come for info on the First Wave of Canadian Comics. Being alive is learning all the time and I love sharing what I’ve learned about these books. Ivan, great panel at Toronto Con and looking forward to your book as well as your continued insights and discoveries on Canadian Comics. 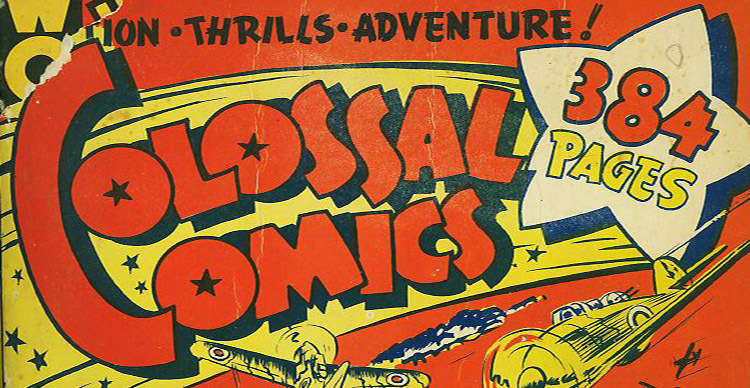 Looking forward to continued celebrations of 75 years of Canadian comics. Thanks again, Brian. It was good to finally meet on the weekend and I hope that things go smoothly with your book. I look forward to finding out how Canadian horror culture may be different from American or European horror culture. Maybe we can do a few more of these panels on the 75th anniversary at upcoming cons in the spring and summer. Let’s see…. More great stuff as always, Ivan. I think Polka Dot Pirate and The Penguin are two super-well designed characters and wish they had continued forever. I’m excited for your book but don’t think you should use a “celebrity” cover artist. As much as I love Seth’s art, for instance, and despite his being a great fit and a fan of the subject matter, not to mention a fantastic book designer, I feel these history books should feature as much of the original artwork as possible, as it is so rare and compelling in its own right. It might seem odd to say, but I’d much rather have a poorly-designed cover, with some off-the-shelf lettering, but sporting a colour image from a 1940s Canadian comic in my hands and on my bookshelf forever. Thanks, Bryan. I agree with you about Polky and Penguin. I also agree with your reasoning and sentiment about the cover for my book. I don’t necessarily want to make the book popular. I just want to make sure that the individuals inside it and their work during this period are not forgotten by those people who are interested in them and who care about them. 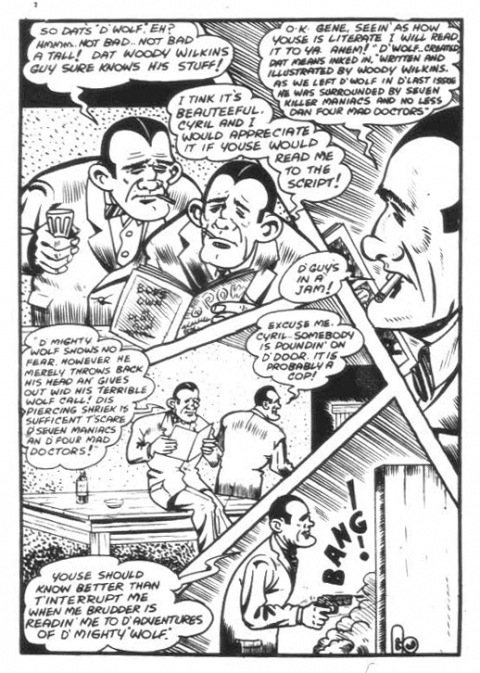 I want this book on their shelves and in libraries so that younger people who might not know them but who want to find out more about Canadian comics and the people who created them.